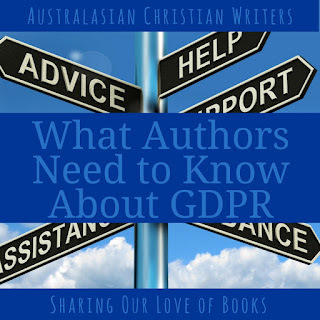 What is GDPR, and why do authors need to know about it? First, the PSA. I'm not a lawyer, so none of the information in this blog post is legal advice. It's my best guess as a layperson who has studied the subject. If you want legal advice, you ask a lawyer who is qualified to practice in this area. In this case, that means a lawyer based in the EU with a background in privacy, data protection, or similar. You don't get legal advice off the internet. There are two excellent YouTube videos from British lawyers, and I'll link to those at the bottom of the post for those who want or need to know more. The GDPR is the General Data Protection Regulation, and comes into force on 25 May 2018. It harmonizes data privacy laws across the European Union (EU), so it affects any organization holding personal data from EU residents. Note that the EU still includes the United Kingdom, so GDPR still applies. The British government have indicated they will implement GDPR-like legislation following Brexit (if it goes ahead). 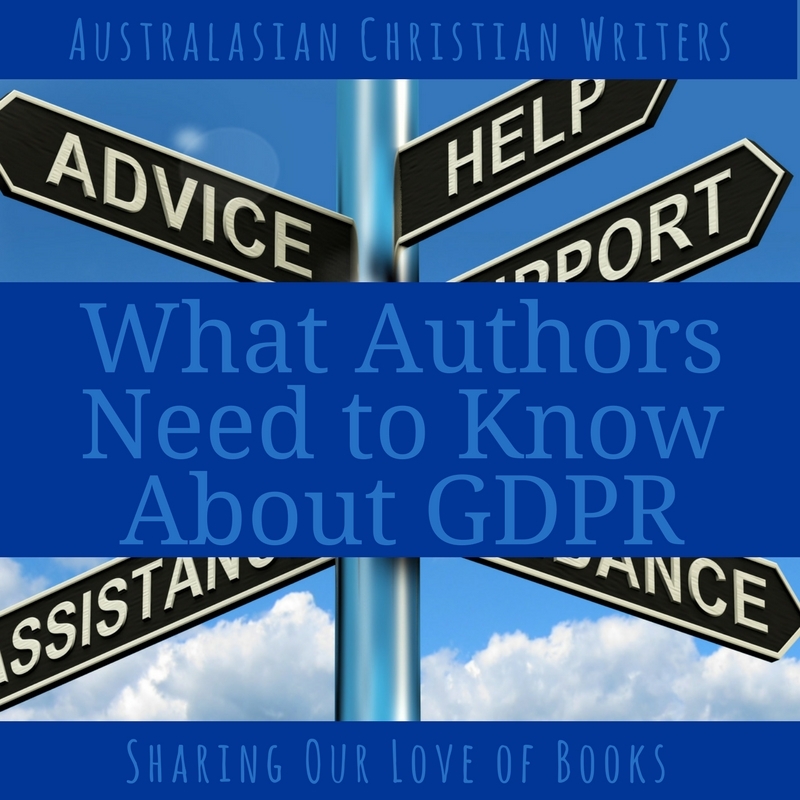 Why do authors need to know about GDPR? GDPR affects all organisations based in the EU, or supplying goods or services in the EU, that collect and process the data of EU residents, regardless of where they are based. As Australasian writers and bloggers, we're not based in the EU (Australia might compete in the Eurovision Song Contest, but that doesn't make Australia part of the EU). If we have a book listed on Amazon.co.uk or BookDepository.com, we're indirectly supplying goods. If we have an email list that includes EU residents or may include EU residents in the future, we're supplying services, and we may also be marketing to EU residents. If you have a self-hosted website, then your site is collecting a lot of information on your behalf, and you are responsible for ensuring only the necessary data is collected, that collected data is kept private, and that it is deleted on request or within a reasonable timeframe. For example, if you comment on www.iolagoulton.com, I ask for your name, email address, and website (although that’s optional). But the website also collects and stores your IP address, and may store cookies (e.g. so the site remembers you have commented before and that I approved your comment, so subsequent comments aren’t held for moderation. Another cookie knows not to show you the email signup pop-up more often than once every 90 days). Yes, you need to know about GDPR. But GDPR isn’t the big bogeyman some commentators are making it out to be. Sure, it toughens up on the way we collect and use personal data, but the main principles are around people who hold personal data using that data in a way that is fair, transparent, and lawful. We tell people what data we are collecting, why we are collecting it, what we are going to use it for, and we only use it for that purpose. And that purpose must be lawful. We only collect the data we need, with the permission of the owner of that data. We do not pass data on without permission, and we make sure anyone we pass data to is also collecting and using that data lawfully. 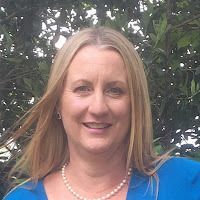 Yes, there is an exception, and that's when your website or blog is managed through a free provider such as Blogger (like Australasian Christian Writers) or WordPress.com (but not self-hosted WordPress.org). As best as I can tell, Google owns Blogger. Blogger/Google collects personal information every time we upload a post to Blogger, or comment on an existing post. The writer owns the copyright, but Google owns the platform. If this isn’t right, please let us know in the comments (with the appropriate link), and I'll update the post. What do you need to do to prepare for GDPR? SSL certification adds a layer of security to your website. If you don't already have SSL certification, now is a good time to consider it. You may be able to get a free SSL certificate from your web host. Neil Patel at Kissmetrics has just published a detailed post on the subject. Most websites have a contact form allowing visitors to email the website owner. It seems pretty obvious to me that completing a contact form means the website owner is getting your personal information, but some people are recommending adding a tickbox to make this explicit. Most blogs have a comments section, which collects personal information. Do we need to add a tickbox for specific consent? I've seen blog posts from non-experts that suggest we do, but my WordPress site doesn't have any way of adding a tickbox to comments. However, the WP GDPR Compliance plugin also handles comments, so I've added the tickbox using this plugin. It took another three minutes. Sign up for my email list to receive regular newsletters and occasional marketing emails. In return, I'll send you a free gift! Want a free gift? Sign up here! Even better, have a tickbox as part of the signup form, so your website visitors know exactly what they are getting. I use Bloom from Elegant Themes* for my website signups, and that doesn't have the tickbox option. Yet. MailChimp* does have GDPR compliant forms, but they are not as pretty as my Bloom forms. * These are affiliate links, which means I get a small commission if you purchase something using these links. The amount you pay does not change. If you don't want to use affiliate links, then use your favourite search engine to find the sites. Do you need to contact everyone on your list before 25 May to reconfirm they want to be on your email list? This is the really hard part, and it's something even the experts can't agree on. Some experts and mailing list providers say yes. They say you need to email everyone on your list and ask them to reconfirm their consent, then delete the people who unsubscribe or don't respond. The issue with this approach is you will lose a large number of subscribers (although it is argued you're only losing the unengaged subscribers, so cutting them will improve the performance of your list). Some email list providers (e.g. AWeber, ConvertKit) seem to be able to segment out EU subscribers by their IP address, which makes the consent process easier. If your email provider has this option, it's worth exploring. Other experts advise against asking your email list to reconfirm their consent, because sending the email implies you don't have a record of their consent and you shouldn't be emailing someone without their consent. The approach you take will depend on how you built your email list, and who your email list provider is. MailChimp (my email list provider) seems to be taking a softly-softly approach. Others (e.g. MailerLite) seem to be more aggressive in requiring list owners send reconfirmation emails. There should already be an unsubscribe option on every email you send. This is passive consent—do nothing, and you're on the list. The principle of GDPR is that subscribers must actively consent to being on your mailing list. That is, they have to check the box that says "Sign me up!" to be on your list, not uncheck it to stay off your list. There is one thing the experts agree on: this is a good opportunity to either try and reengage your email list, and to delete those who haven't opened recent emails (say, any email for the last three or six months, or your last three or six emails). This is the approach I have taken. I will be updating the Kick-Start Your Author Platform Marketing Challenge to take these changes into account. If you're already enrolled in the Challenge, I'll email you once I've completed the updates. If you're not in the Challenge, why not sign up? Iola holds a degree in marketing, has a background in human resource consulting, and currently works as a freelance editor. When she’s not working, Iola is usually reading or writing her next book review. Iola lives in the beautiful Bay of Plenty in New Zealand (not far from Hobbiton) with her husband, two teenagers and one cat. Thanks, Iola. Useful as always. I don’t suppose you know how much a paid membership of zegal.com is? I’ll need to check it out. It's a monthly subscription, and it seems like it's designed for small business (as a lot of the templates are for things like employment contracts - vital, but not something I need). No, I don't think the EU is going to come after single authors. My understanding is they will only be responding to complaints, rather than trying to police us all. But GDPR highlights what should be common courtesy and good business practice for us all, so we do need to know what's happening. Thanks so much for organizing all this info for us! Thanks, Iola. Very helpful to have it all together. I'm pleased you find it helpful! I've updated MailChimp and segmented my list according to method of sign-in. The WP form plug-in I use for MailChimp isn't updating the fields for GDPR marketing permissions. I'm hoping they'll have an update that adds in the fields. Fortunately I've always used double opt-in for newsletter signups and MailChimp tracks this data. It's complicated and it's the lawyers who'll make bank on this bureaucratic change. The lawyers currently can't agree on some of the major points, so they are certainly going to be the winners in this! The actual doing isn't that hard. The hard part has been wading through the information to try and get the best possible advice so I know what to do.